So you might not be looking for an extreme experience, especially if you have children in tow, but that doesn’t mean you can’t still have a bit of adventure. Adventures are all part of holidays and part of the story we want to tell others on our return. Shared experience with our tribe of family and friends are what make life memorable and fun. So I thought I’d get offer some ideas on how to find fun in the country and in particular here in the Malverns on our Glamping site. but these ideas are universal, adventure is as much a state of mind as it is an event. I am lucky enough to run a Glamping site in the Worcestershire countryside right by the Malvern Hills. Part of the joy of welcoming guests is, watching their shoulders drop as tension is released and the agenda of everyday is replaced by, well very little. So I set about thinking about simple adventures which keep your tribe happy and help to pull you all together, without being costly or too onerous. So here goes. I don’t know about your family but mine include a mix of outdoor types and snuggle up in front of the sofa types. So when it comes to suggesting a ‘walk’ the response is mixed. So I went about thinking about how I could make a walk an adventure – an epic! 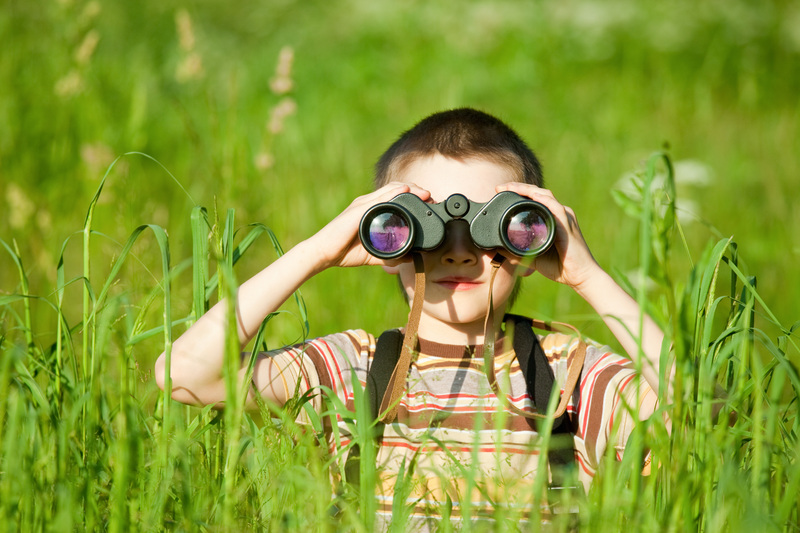 So a walk became a search for treasure, geocaching has become very popular and now many families love the hunt for something (however small) across the countryside. Mystery and being ‘lost’ adds to the drama so a map and a compass can be great for a bit of problem solving mixed with the excitement of not quite knowing where you are! A sense of not always being in control and having everything planned adds to the mix. 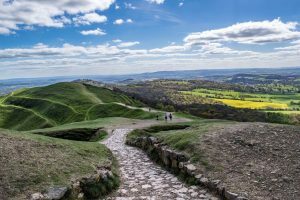 The Malverns aren’t quite high enough to be classed as mountains, but they are definitely steep enough and big enough to test your lungs and your map reading skills. My family has loved wandering the hills and one of the first challenges we set for our kids was walking the length of the Malverns and back, ( a good 20 or so miles) , which needed some encouragement especially for my 7 year old daughter ,(mini eggs as it was Easter) but they loved it, and still remember it in their late teens. So Grab a compass and map, water and a picnic and go in search of adventure on foot. Find local landmarks or special places, such as a mystical old tree, or natural springs which you can discover on route. Draw it out into the summer evening enjoy a breathtaking sunset over a glass of two before wandering home. Go the distance in the saddle off road and on. In the saddle your adventures can take you further afield. We enjoy pedalling the hills but the lanes and trails are equally as lovely. For miles of off road trails the Forest of Dean is a great place to pedal too, and just down the road. They have trails built for the job and uplift services for the true downhill adrenalin seekers. Nevertheless common land trails and bridleways are lovely for a softer off road experience, as well as miles of lanes. Pack a picnic or head for a destination pub or tearoom and make a day of it. Design a route with the kids and find places to stop off along the way, a place to paddle. Create little challenges to get you all uphills or stop and say hello to a pony or cow along the way. These days Apps offer a great way to collect information and kids love to see what they’ve achieved, tell them how far they’ve gone and the heights they climbed or how fast they went downhill. Collecting things is a nice way to remember a holiday. It can be anything from leaves, feathers, stones, photo’s they all add to the memories and can develop new passions and interests. My daughter always collects rocks, whichever holiday we returned from there was always a pocket full of stones. Now she is about to embark on a geology A level. Discovering new objects and species is like imagining yourself to be a groundbreaking explorer and uncovering ancient treasures, all part of an adventure. Locally we are lucky enough to sit close to three rivers the two most notable are the Severn and the Wye. 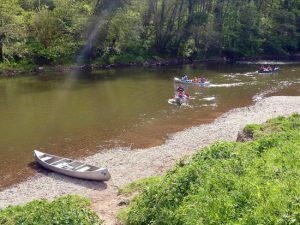 Whilst the Severn is the big boy and popular for rowing and boating, it’s the Wye where you can mess about in a canoe. Pack a picnic, and float downstream. Tackle the rapids, moor up and have a splash about; spot Kingfisher, Red Kite and Peregrine Falcons along route and finish your trip with a lazy pint in a local. Canoeing is other worldly, and slows us all down, but with a spice of excitement with the prospect of getting soaked and battling to stay on course, whilst also being a lot of fun. Locally there is a spy quiz harking back to Malverns secret service connections follow it and solve problems along the way to find your final destination. Whilst in Ledbury shop owners have created secret fairy doors which children have to find on a trail which is a fun way to explore one of the best independent high streets in England. On site at Up sticks we have kit for den building as well as our own glamping awards for trying new things like plucking up the courage to pick up a chicken, or tasks like watering the veg plot or planting a seed; Finding kindling for the fire and learning how to light one. We have nature packs to test PH of soil, or a quiz to identify as many trees, birds and flowers as you can. We challenge guests to get creative with something in nature or forage for food. All good fun, free and gets you noticing things that previously passed you by. If you want to keep it really simple then there are trees to climb, or dens to build, games to play and stargazing at night. Personally I love to watch our glampers create their own world or games and fun be it from turning a tin bath into a boat or creating a unique piece of art from twigs. It all adds to the adventure. Adventure comes free with imagination, and we’re here to help you find your adventure.